Please enjoy this Zacatecas music while you read! The opening website page includes a “Pretil.” This is a term used mostly by gente de rancho (country folk). The structure is usually made of concrete, adobe, brick, or tile and has a border to prevent things from sliding off the surface which is used for preparing and serving food. Some pretiles also includes an open oven which is a cavity-like structure that is used to cook and also adds to the warmth of the special place called “La Cocina.” This special place in a home defines the type of social interaction that will take place at least twice a day. The ambiance adds to the aroma and flavor of the food not to mention the social interplay that makes this place the hub of any country home. In building our own PRETIL, all I had to do is reflect upon my childhood; one’s imagination is the only limit. My next project is to build an oven such as the one we saw at Lidia’s grandmother’s Ranchito in Armadillo, San Luis Potosi, Mejico; I regard this small place as the UTOPIA or an OASIS of history, beauty, tranquility and friendship like no other place I have ever been. The theme is “FAMILY PRETIL” and the photo serves as a canvas that displays many family items representative of a timeline of more than 200 years. Posterity is also important in sharing a small sliver of our family history. Providing that technology does not become obsolete, the website should be active for generations to come. Pause for a moment. Tejas means “Friendship” and Guadalajara where I am from is the city of “Amistad” essentially the same as in Tejas and the euphemism that Guadalajara is Mexico’s girl-friend according to the popular singer Jorge Negrete! Need I say……. MAS? You can Google this grand artist who was born 100+ years ago and enjoy one of the best known musico-cantante of all Mejico. By the way, as technology was introduced to the world, Mexican artists made names like Guadalajara and Mexico the most frequently used words in the Music Industry. There is no lack of cultural, historical and family “HUMILDE HERENCIA” (humble inheritance) at the Salinas’s home. Sentimental value is what drives our website so we can share part of our story and the story of countless others who made the trip to Oregon more than 50 years ago. Our website’s name denotes the PRIDE that we have in all the FOUR CORNERS of our development: Tejano, Mejicano, Oregonian and most of all and more importantly are reverence and loyalty to the USA! Si Seňor…Los Estados Unidos de America! Our lifetime goal is to dedicate our HOUSE as a museum where members of our family which will no doubt be more than 200 can come and enjoy the house where my father Arturo and my mamά Maria Salome spent their last days. It is our wish to spend our last days here GOD willing. ITEMS IN THE PRETIL We have named and described in short detail the items that we selected for our display. Needless to say each item is deserving of a short story. I spent 2 weeks looking for the appropriate and relevant photograph to use as a backdrop to our website. After my morning daily coffee run on the 16th of September which happens to be Mexico’s 4th of July or “Dia de la Independencia” I came home and the sun was shining in our back patio and…. “Look for the picture no more” (a Eureka moment) an immediate discovery and solution and the perfect spot for a display that would help me tell part of the story; our own PRETIL. It did not take long for my wife Lidia and me to come up with some props and it was all done within a couple of hours and a few clicks of the camera and it was done. Lesson learned; the solution was in our back yard and the bright sun that morning helped illuminate the backdrop for our website. MOST OF THE ITEMS ARE DISCERNABLE AND ARE EXPLAINED AND DESCRIBED FROM LEFT TO RIGHT. ITEM (1) A pair of miniature boots given us by our daughter Olga are salt/pepper shakers and are behind a red chili; all ceramic. These are popular items thorough out the southwest and especially Tejas. Tejano appreciation evolved in our household over the last 50+ years. ITEM (2) Positioned vertically is a small branch that was cut by one of helpers in 1992 when we begin to break ground to build our house. What a coincidence 500 years after Cristobal Colon; I will not include that he discovered America, because some of you will probably start a debate. Nevertheless, he of course was a special historical figure in the evolution of the New World or Western Hemisphere. The branch in combination with a machete was used by a fellow named Benito to find the right spot to find our home’s footprint. People who saw this small man use the machete and the branch were amazed with his use of the wooden hook and machete-machine precision! ITEM (3) A small bowl grayish in color and with a unique blend of OLD is an item that has been passed by my wife’s ancestors. Lidia’s unique background embraces a large territory; from the desert in Humboldt, Arizona to San Miguel De Allende, Mexico a distance of 1500 miles and intersecting two naciones vecinas (neighboring countries). ITEM (4) Iron stove part to the left of the board is an iron stove place insert; estufa de leňa. The wood stoves were popular in Tejas, as well as, in Oregon. This piece, I found in one of the dilapidated camps. I also found other items that were discarded and I decided to make them part of our future MUSEO DE MIGRANTES. ITEM (5) Mapa de Tejas Below the hat is the silhouette of the Lone Star State which had its share of names and flags during the turbulent identity crisis; Google it and you will find out the great variety of “Sentimientos” nationalistic sentiments that engulfed the largest state within the lower 48 states of USA. On the left side of the map is the first stick house build by the new arrivals from the state of Cohauila. Don Francisco y Virginia Salinas (my grandparents) build the house around 1910 close to the date when Asherton officially became a township. ITEM (6) La Tejana needs no introduction; I am referring to the hat-sombrero. For those of us who have traveled in Texas and have seen authentic movies of various pueblos en Tejas we have seen many “Tejanas.” Tejana is of course derived from the word Texas. Tejana has basically two meanings: one, a lady from Tejas (feminine gender); and two, Tejana is referred to the special sombrero. Tejano vaqueros or people who know their hats will see if the shape is authentic perhaps a brand is unique and reflects that special “Tejano look”! The word “look” has been adopted by Spanish speaking people; it seems that the word “look” has special meaning in English that is not transferable to Spanish; no surprise here!...since Spanglish is spoken☺! Francisco “Pancho” (named after his abuelito) my distant cousin lives next to the house and had to disassemble the house as it was wilting to the ground after more than 100 years. There is a man that still remembers the house as a modern addition to Asherton at the turn of the century. 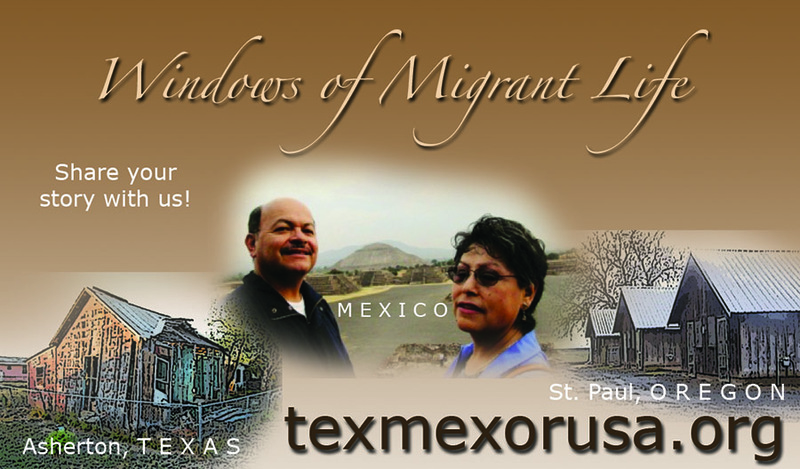 His name is Ponchito Benavides (see his own story under Familias Migrantes) or just type his name in the locator cell. Soon a manuscript will be written about this special place. GRACIAS Ponchito for introducing me to my dad’s house-March 2008 (video/audio interview). ITEM (7) Window from a special cabin The migrants who traveled to Oregon from Asherton were well aware that they had to endure a different life style. Most of us were used to the rigor, discrimination, segregation and other social ills of the day (1940-1960); and living in cabins was no exception. Crucita Robles Garcia explains the contrast better than I can. “We came to work and we had to adjust to what we were given.” She remembers her experience in the Fairfield area where her family first arrived in 1948. In 1955 her uncle Rosalio Salinas brought the entire family. The cabin shown in the window (lower L) is the cabin they occupied. Normally this cabin would have accommodated two families and indeed it did with the Salinas Family as they were 10. A couple of light bulbs, wood stove and a cold water faucetwere the comforts of “la cabaňa.” AFUERA a word that means “outside”, also meant the “out-house.” Mikes (Miques… phonetic pronunciation … “Meekes” explains the word better than most of us and with a smile and color. Across from the Davidson’s camp was Ralph Casey’s farm. He also had structures that were used to house migrants like: Padron Family, Salinas Family and a few more. Depending on the size of the family every spring, people would move to the cabins that best suited their needs; first come first serve! The cabin was part of the Don Davidson’s Farm or Rancho as we used to call it. About 120 yards east from Don’s camp stood the Ed Davidson’s camp; Don’s brother. My family lived there and we used to run from camp to camp using the open field or sometimes a field that had been planted. Leonardo “Nando” Ortiz (RIP) visited both of these places and we talked about our experiences as if it was yesterday. Nando and I took a half a day to tour our past de 50+ AŇOS! Nando could really tell a story the Tejano way, that is Spanglish and with Tejano vernacular. It’s a bitter sweet to be so close to one’s past. Nando passed away two months later; my, but BOY!! !..Did he enjoy the tour! Time, space and our amigos have a way of keeping us HUMILDES…we all understand the consequences if we move away from this special past and do not recognize it as part of US! An audio/video clip can be found under “Ortiz” Familias Pioneras. ITEM (8) On March of 2008 we stopped to see house where my dad was born after we visited with Ponchito. Outside the cyclone fence which was protecting the public and the house, I found a blue board. I picked it up and brought it home. The board was part the Salinas house. The board tells its own story just by looking at it and touching it. Carpenters especially would be intrigued with its presence and wood qualities. I asked Pancho who is my distant cousin and who has lived next to the old house all his life to save me a few boards so I can build something special and remember the “Familia Salinas” y especialmente a nuestros abuelos Francisco y Virginia los dueňos originales. The photos on the right of the Tejas map are a photo collage of part of the Salinas Family. I am embarrassed to admit it, but due to our move to Oregon we don’t know most of our family. The 2K+ miles away have not made it possible to even maintain a casual contact. Thankfully, technology has helped a few contacts, but it continues to be a challenge. The farewell took another hour; too much to share and a friendship that was embracing the past. Progreso was “de calle” (street) that Carlos lived on all his life. Unfortunately, today Carlos finds himself with little “Progreso” of his own, due to the new economy in a place that once was a Dinero $ Mecca. Carlos was an honest, humble and friendly man. I remembered he was the only person who would socialize with the renters. So, I took a risk and asked Carlos to help me confirm my impressions of the entire family; he obliged with honesty and with a smile unlike the smile that he used to express when we were kids. Carlos is 6 years older than I am. He was a teen ager and I was eight years old when we rented a small shack from his dad Antonio. Don Antonio was known by the entire town of Piedras Negras. He had rentals from one side of town to the other. My impressions of the family were well confirmed. “Tu te acuerdas de todo eso?”.. You remember all that? Carlos asked. The family was unique and well to do thanks to Don Antonio who was a 24/7 empresario. There was also a sibling whom for some reason or perhaps many did not match the family pedigree; Carlos knew what and who I was talking about..so he added “he is still the same” while shaking his head expressing disappointment. As we were approaching the door to leave the place I used to sleep in, I asked Carlos if I could have a memento. To which he answered take anything you want. “No puedo hacer esto Carlos” just give me something that has no meaning to you…and then I took a wire covered with rawhide as it was old, rusty and bent. He then showed emotion and sighted as he explained that “The Latigo” was his dad’s discipline tool. “Lo he querido tirar”… (I have wanted to discard this thing…so it’s a good thing you want it; take it. What else do you want?) Typical Carlos he had not changed..Friendly and generous! Then we embraced and I told him next time I come and visit you, I will be glad to clean your shop. And then he replied, “I can look for some of the rental receipts we used to give your mom”. My dad liked your family because you always paid the rent on time. To which I replied…GRACIAS A MI PAPA ARTURO. Meanwhile, it is getting late and the two Lidias are still visiting en la cocina……YA VAMONOS! How does one interrupt an endless good-bye? Not easy since the two “Lidias” were enjoying their first contact. ITEM (10) IDOLO INDIO (poquito de Spanglish ahead) Mi tio Jesus who lived in Guadalajara was like my own dad when I was growing up. He and his brothers Salvador “Chava” and José “Pepe” were nationally known cyclists in the early 1950’s. Jesus was also a cyclist except he had a habit that was not allowed by the professional racing team; a little drinking and a little smoking. I recalled he knew better on how to live “La Vida Loca” as interpreted by a four year old, so I could have been a bit too conservative as were the entire Moreyra Family. Jesus was born in Chapala, Jalisco known for its lake and natural beauty. Descendentes of indigenos de una área donde vinieron los Españoles a conquistar. Jesus, was also interested in history and anything that was old and had peso$value. He was well known in the political circles and people sought his knowledge, wisdom and opinion. He was also not shy to express, criticize or to initiate petitions to create change. “Comercio” had always been Jesus’s passion. He spent his entire life selling and buying and exchanging; 50+ years at the same location…Talpita, Jalisco. In 1976 when I visited him, he was operating a small store…”charrangito” he used to call it that measured about 4x4 metros y no mas! He and his wife Rosina would keep each other company from the time the store opened to the time it closed which means flex-hours in accordance with their other duties, dias de fiesta and their health-salud. A remarkable thing about Jesus was his ability to keep inventory of his entire stock and did not need a calculator to compute. He also resorted to the “honor system” when people used to be more honest he added in the conversation in 2005 when I interviewed him. No mas! he said…”las cosas han cambiado” (things have changed). What used to be a tranquil area of town now had two faces. During the day commerce and a normal life seemed to engulf the area which used to be on the rim of Guadalajara. At night, it was like making a movie: lights, camera, and action! not the kind of action that he was proud of. Red lights or casa de cita seem to provide survival for a few. And the area was transformed to something that in Jesus’ childhood would have been only a nightmare. Nevertheless, a “live and let live” attitude prevailed and at least there seemed to be no drugs, or other aggressive social acts. No longer the same in 2013, sorry to say, now that Jesus is no longer with us. After visiting him and having a lonche like the old days which was comprised of: sardines, chile jalapeno en rajas, quezo grande o panela, a refresco barrilito, white rice and beans and birote…my, what a treat! Before leaving he said to me-“Tengo unas cosillas para ti”… I got some little things for you. I want you to have them. Family reliques that have been part of the Moreyra Clan for generations. The figurine are now part of our collection and part of our Cultural Regalia Kiosk we use to share our story….OUR ROOTS! Living in el Rancho de Potrerillos, Jalisco during my infancy, country living was part of life. I recall my tio Juan coming home after a hard day’s work in el potrero. He and his burro or caballo would enter the casa via the front porton. A hall way separated the street from the patio or back yard. The back yard belonged to the animals and the burro had its own corner. I could see his sweaty shirt, calloused feet as he wore guaraches most of his life, in fact, I was told that he never wore shoes his entire life. And his drinking gourd would be empty. As a child, I would rush to get some cool water and the memory to this day remains like a digital chip in my brain. Two years before he passed away, I took mi familia to visit part of my past and mi FAMILIA del rancho which included mi tio Juan. After visiting, I asked him if I could have it. “Es tuyo, llevatelo” … It is yours, take it. The gourd is close to 100 years old; I am blessed to have it. Nunca ha tenido agua otra vez. I have hesitated to fill the gourd with water again; respeto mucho a mi tio Juan. Most families of the Catholic Faith and regardless of national origin proudly display the FAITH Symbol of the AMERICAS. As a historian and amigo of many “Pioneros de Oregon” I have seen small, large and life size statutes of la Virgen Morena. My family also had the pleasure of visiting La Capilla Principal in Mexico City. When we visited Mexico City and went to El Sanctuario and the Pyramids we were energized and our spirits were lifted in a way that we did not expect. Most Mexicans of FAITH feel a special connection to this LADY no matter where we are. However, the site in Mexico City has been a permanent MEMORY! 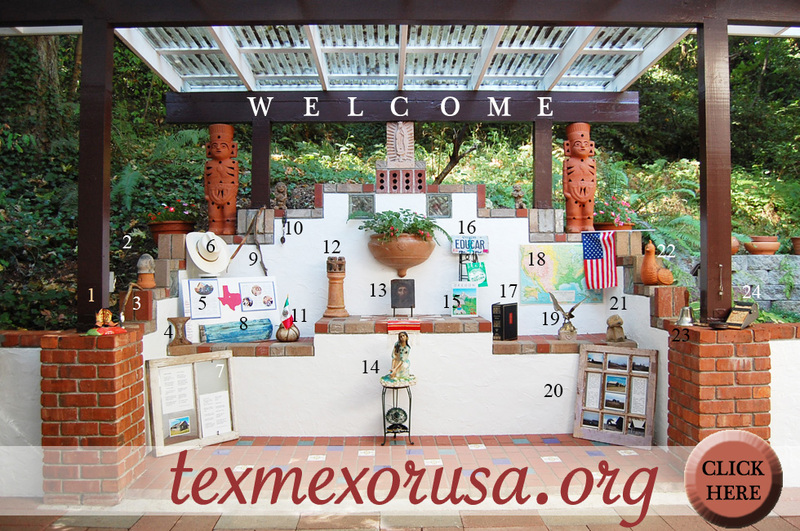 The small carving and three dimensional figurine was purchased in the state of Coahuila in 1988 when the whole family went to Mexico on vacation. My mother Maria was still alive then and it was a SPECIAL TRIP. The story can be seen simply by Googling the Catholic Sentinel or other avenues of religious information. Most Catholics in the 22+ countries where Spanish is spoken celebrate El Dia De la Virgen in December 11th and 12th; the time is extended depending on the local organizations, parish or religious leadership. Some parishes have made extra efforts to place a statue or painting of the Virgen and adorn a special place in church such as St. Luke in Woodburn, Oregon. While other churches have a lithograph version, photograph or other visual displayed within the church but seemingly not with the same reverence as the Lady of Guadalupe deserves. At the present time Catholicism among residents of Mexican and Latin Roots now comprise more than half of the parishioners. It is believed that the clergy needs to be more attentive to not only the conventional religious needs of the state’s congregation, but also demonstrate more inclusiveness and respect to other aspects of our BELIEF SYSTEM OR TRADITION. ITEM (13) BELOW THE PLANTER In the image of JESUS made in copper and highlighted with special paint. This special copper art piece has been passed on by more than four generations. It is an ICON that has been in the Saldaňa family and we are blessed to have it in our home. The ICON precedes the civil unrest in the north part of Mexico during La Revolution that involved people such as Pancho Villa, Venustiano Carranza, Francisco Madero and many others. Doňa Rufina Meza Saldaňa( Lidia’s grandmother) in the late 1900 used to travel via train from San Luis Potosi to Arizona. She was a UNIQUE lady who was able to travel, take care of a family of 7 children. Half of her children were born in the US and half in Mexico. Mr. Leon Saldaňa her oldest son interviewed her in 1988; see a video-clip of Doňa Fina; a one of a KIND LADY! ITEM (14) HAND ARTICLES COMPOSITION Mi mamά liked going to the 2nd hands stores. Regular stores and buying new was unthinkable in our family. Our week end outings were to visit “Las Segundas.” My mom knew that with a few centavos she could bring home useful things she needed including knick-knacks to enjoy in our small living space. The items represent some of her collection. The ceramic lady sitting on the iron stool was one of my mom’s favorites; it’s also one of mine. The stool was also purchased at one of the 2nd hand stores. Back in the 50’s and 60’s the garage sale craze had not reached our society yet. As a child I learned that 2nd hand stores smelled differently than regular stores; I don’t need to describe the difference. The innocence of a child is hard to explain. Looking back, I remember more the 2nd hand stores as they each had their own unique way of attracting customers and the price was always “negotiable.” Not a week goes by that I don’t drive by these monuments of HISTORY. A few dollars then would make me a rich man today. Oh well “MEMORIES” are also valuable as they stay with you forever. ITEMS (15-16) OREGON COLLAGE In 1996 when we purchased a new car we decided to buy a personalized license plate; we selected the word “EDUCAR.” Our small achievements to date we owe to our EDUCATION; the word EDUCAR in Spanish means “to educate.” My wife and I were privileged to have contributed professionally to the profession and the Oregon Community. We both graduated from HS in 1966; she was the first Mexicana graduate from Woodburn Hi and I am the first Mexicano to graduate from Gervais High and it seems that we were always in school and in some ways we still are (NOTE: the enrollment at our alma mater now consist of 60%+ students with Mexican roots.) Lidia volunteers at our granddaughter’s school and also tutors our little ones every day. Driving them to school, tutoring them, volunteering in the classroom some of the time consumes Lidia’s time; she is happy to do it. The collage includes a coloring book used by our little ones to learn ALL about Oregon. A stand-by visual is a “Made in Oregon bag” which needs no introduction. Former migrants who have been in Oregon more than 50 years claim Oregon as their their place of origin; why not, after a half a century the claim is made with pride and ownership. As we travel and meet new people outside Oregon we do our best to share a little bit of Oregon with others. ITEM (17) IDOLO INDIO Earlier, under the Idolo Indio, I introduced my uncle Jesus from the state of Jalisco, A generous man who communicates with the gift he gives. In the year 2005 he decided to give me one of his most important possessions, his BIBLE; una familia CATOLICA Y APOSTOLICA! I was raised by the Moreyras for a few years during my infancy. Most of what I learned about religion, I learned in their home. This conveyance of a special BOOK would create a father-son relationship. He confided in me and he asked me for my advice the same way I used to get advice from him naturally unsolicited as I was under ten years old; a wise man indeed mi tio Jesus! ITEMS (18-19-22) MAP-EAGLE & US FLAG These three items represent LOVE OF COUNTRY! One common thing my wife and I have is that each of our fathers was born in the US and our mothers in Mexico and so were we. With this family pedigree we are proud to revere OLD GLORY, USA, and all the symbols that are representative such as the EAGLE! As a young man I served in the Oregon National Guard; I was the only Mexican-American in our Unit. It is with ORGULLO that acknowledge the many young Tejanos-Mejicanos who served the USA Armed Forces. The colors, symbols, flag tell only part of the story…GRACIAS MIL K+! ITEM (21) A STONE FROM DOŇA FINA’S HOME Above the window is a stone that came dislodged in the year 2000 as Leon my father in-law was given us a tour of a special place. An adobe structure measuring no more than 12x12 was Doňa Fina’s first home in Armadillo, San Luis Potosi. A photo of what I called the OASIS of San Luis Potosi is found in the Saldaňa Photo Gallery. ITEM (20) ANOTHER WINDOW FROM THE SAME famous cabin. With captions and short stories in the glass panes citing a special time. ITEMS (22-24) THE BELL COLLAGE is explained using a noun in the fullest form, i.e. person, place or thing. In 1980 we purchased our last property and built a house where we hope to live the rest of our lives. The last name of the person we brought from was “BELL.” It was a purchase that had many sentiments, coincidences and connections to the past that were difficult to believe. After Mr. Bell retired as an engineer he started a nursery in the location where I now live. A short time after his retirement and while at work, Mr. Bell suffered a massive heart attack. After his death his wife locked the door of the small building that used to be his store and she never went back. It was 15 years later after Mr. Bell’s tragic death that she and her attorney Mr. Hill would return to the property to turn the keys to me when we purchased the property. Mr. Hill and Mrs. Bell were special people with exquisite elegance and optimal social and business protocol. When we decided to enter into a contract sale, I remember the two wonderful and well seasoned people in their special attire arriving in a vintage 4 door sedan 1956 Packard Clipper two-tone with a bit of black detail along the fins of the car. I have never seen a car like that since 1980 and I doubt if I ever will! “Bell” has many positive meanings, but among the ones that best describes this couple is: beautiful and handsome. No doubt about this definition; moreover, Mrs. Bell reminded me of my grandmother. We took liberty to use “THE BELL” as a symbol of appreciation and respect for the property. The premises were never disturbed after Mr. Bell’s death. All the articles remained where they were at the time of his death including his office articles which were part of his modest bookkeeping implements. Most of what was left on the premises we kept. My dad Arturo helped me revive the place and it became a rental. Last but not least, thanks to Little Baja Mexican Curios located in NE Burnside in Portland Oregon operated by Raymond and Gloria I got a good deal on these two giants (Indian figurines) and they are the Guardians of the Pretil. The items that adorn our home represent a constant reminder of a special PAST. THE WEBSITE IS EVOLVING EVERY DAY The development of this website is biographical, as well as, autobiographical. We try to keep most of the content within the “Migrant Experience.” By Migrant, I mean the people who traveled to Oregon starting in the 1930’s to 1960 and who principally came from the southwest part of the United States. OBSERVATION Currently, in the Year 2000 + ERA the expression “migrant” is used interchangeably with the people who “immigrant” to the United States. It is important to understand these terms within their unique context and relation to our story. NOTE Most of the people whom we have interviewed or have met along our “Oral History” journey mentioned having relatives south of the border. The contrasting difference between migrants from 100 years ago and the migrants now is the fact that most had ties to the northern part of Old Mejico. The migrants/immigrants today have more ties with families from the interior of Mejico and not the northern states. “AMERICAN” this is another word that has multiple meanings. When it is preceded by the word “north” one understands that the term relates to Canada, United States and Mexico (see map below). However, in most contexts when the word “America” is used, it usually means only the United States. The author maintains a view that this ownership of the term also expresses territorialism and also acknowledges a need to treat Canada and Mexico separately from the United States. This view will be discussed later as we explore the Pre-Columbian and Pre-Ellis Island ERA. This is only Miguel’s view given the data reviewed. MOST SOURCES SHOW THIS CONFIGURATION OF “NORTH AMERICA.” Thank you Wikipedia for the sample photos. THANK YOU FOR VISITING Please use our Contact Page (comments/questions etc).